The 2018 Mercedes-Benz C-Class offers a pulse-pounding, luxurious ride that Johns Creek and Alpharetta drivers won’t soon forget. Back this year with a facelift to the exterior, updated lines, and a refreshed cabin, the C-Class is equipped with the latest advancements in performance and handling—Including turbocharged engines and G-TRONIC® transmissions. The new C-Class Sedans, Coupes, and Cabriolets keep it classy while putting drivers on the edge of their seats. Up-to-the-minute comfort and safety features sweeten the smooth, agile performance, and can be expanded upon per your preferences. Slip into the high-quality, technologically advanced cabin of a new Mercedes-Benz C-Class model at RBM of Alpharetta! The base engine for the new C-Class Sedans, Coupes, and Cabriolets is a 241-hp 2.0L turbo 4-cylinder. Depending on the model you select, you’ll receive either a 7- or 9-speed G-TRONIC® automatic transmission with DYNAMIC SELECT®. The base drivetrain is rear-wheel drive, but cutting-edge 4MATIC® all-wheel drive is also available. 4MATIC® distributes engine torque to each drive wheel. There are also a number AMG®-enhanced engines, including a biturbo V8 that makes 503 hp, as well as a hybrid powertrain that makes an EPA-estimated 45 MPGe city and 61 MPGe. The C-Class goes above and beyond to keep Alpharetta drivers safeguarded. For protection against harsh crosswinds, Crosswind Assist applies the brakes to one side of the vehicle, keeping the driver firmly in control. COLLISION PREVENTION ASSIST PLUS® works to prevent frontal collisions by monitoring the speed and distance at which you approach straight-ahead vehicles. At up to 65 mph, CPA PLUS® can initiate automatic Adaptive Brake Assist, or trigger PRESAFE® to brace the cabin for a possible impact or rollover. Finally, on long trips, ATTENTION ASSIST® monitors your attention levels and alerts you when rest is imperative. The 2018 C 300 Sedan sports a 2.0L inline-4 turbo engine rated at 241 hp and 273 lb-ft of torque, and earns a 24 mpg city and 34 mpg highway rating. Standard features include a 7G-TRONIC® transmission, a 7-inch display screen, DYNAMIC SELECT® drive program, a rearview camera, and five years of Mercedes-Benz mbrace® Connect. Like the C 300, the 2018 C 300 4MATIC® Sedan also features a 241-hp turbo 4-cylinder engine, accelerating from 0 to 60 mph in 6.0 seconds. What sets this capable sedan apart is its standard 4MATIC® all-wheel drive system with specialized 4ETS® and ESP®, which delivers enhanced traction on rugged or slippery driving surfaces. Equipped with a turbo 4-cylinder engine, a hybrid electric motor, and AIRMATIC® suspension, the 2017 C 350e Plug-In Hybrid Sedan creates up to 275 hp and 443 lb-ft of torque. As expected, gas + electric fuel economy ratings for this premium hybrid are stellar outstanding at 45 MPGe city and 61 MPGe highway. Capable of reaching 60 mph from 0 in just 4.6 seconds, the 2018 AMG® C 43 Sedan owes its power to an AMG®-enhanced 3.0L V6 biturbo engine, which is rated at 362 hp and 384 lb-ft of torque. Fuel-efficient features, such as ECO-START®/Stop and a 9G-TRONIC® transmission, help this energetic five-seater achieve a 20 mpg city and 28 mpg highway EPA rating. As the penultimate C-Class Sedan, the 2018 AMG® C 63 Sedan generates a noteworthy 469 hp and 479 lb-ft of torque, thanks to its hand-crafted AMG® 4.0L V8 biturbo engine. A 7-speed AMG® SPEEDSHIFT® MCT transmission, an AMG® High-Performance Braking System, and a RACESTART®function, make this Mercedes-AMG® a force to be reckoned with. The 2018 AMG® C 63 S Sedan gets an upgraded biturbo V8 engine, which returns 503 hp and 516 lb-ft of torque, zipping from 0 to 60 mph in a swift 3.9 seconds. This range-topper pulls out all the stops with an AMG® electronic limited-slip differential, an AMG® DYNAMIC SELECT® RACE mode, red-painted brake calipers, and 19-inch AMG® twin 5-spoke wheels. Starting at $43,200, the 2018 C 300 Coupe sports a 241-hp 2.0L turbo 4-cylinder engine, rated at 273 lb-ft of torque, 23 mpg in the city, and 30 mpg on the highway. The C 300 Coupe comes equipped with 4-wheel multi-link suspension with AGILITY CONTROL®, a panorama roof, LED headlamps, and a 7-inch infotainment screen. Housing the C 300 configuration’s turbo engine, the 2018 C 300 4MATIC® Coupe also generates 241 hp and 273 lb-ft of torque. This sporty four-seater, however, takes traction control to the next level with standard 4MATIC® all-wheel drive, and still manages to earn a 23 mpg city/29 mpg highway rating. Powered by an AMG®-enhanced 3.0L biturbo V6 engine, the 2018 AMG® C 43 Coupe produces 362 hp and 384 lb-ft of torque. AMG® Performance 4MATIC® all-wheel drive gives this coupe an edge on any terrain, while the AMG®-enhanced 9G-TRONIC® transmission alternates between ECO, Comfort, Sport, Sport+, and Individual AMG® DYNAMIC SELECT® modes. The 2018 AMG® C 63 Coupe gets an AMG® 4.0L biturbo V8 engine, which summons 469 hp and 479 lb-ft of torque. Exteriorly, you’ll find 18-inch AMG® twin 5-spoke wheels and grey-painted brake calipers, while the cabin boasts sport front seats, brushed-metal pedals with rubber studs, a flat-bottom steering wheel, and an AMG® menu with RACETIMER®. At the top of the heap rests the 2018 AMG® C 63 S Coupe, which is powered by an upgraded 503-hp biturbo V8 engine with 516 lb-ft of torque on tap. This ultra-sleek powerhouse bolts to 60 mph from a standstill in 3.8 seconds, and uses its AMG® DYNAMIC SELECT® RACE mode and RACESTART® function to optimize startup revs and traction during launching. Like its sedan and coupe siblings, the 2017 C 300 Cabriolet is motivated by a 241-hp 2.0L inline-4 turbo engine that outputs 273 lb-ft of torque. An all-season power soft top, KEYLESS GO®, LED headlamps, heated front seats, a 7-inch infotainment screen, and an AIRSCARF® neck-level heating system are all included as standard equipment. Equipped with 4MATIC® all-wheel drive, the 2017 C 300 4MATIC® Cabriolet offers superb handling and control during any journey. Altogether, the C 300 4MATIC® earns a 22 mpg city/29 mpg highway rating, thanks in large part to ECO-START®/Stop and its fuel-efficient 9G-TRONIC® transmission. Sharp and race-inspired, the 2017 AMG® C 43 Cabriolet draws its power from an AMG®-enhanced 3.0L biturbo V6 engine, which produces 362 hp and 384 lb-ft of torque. First-rate performance features, such as AMG® RIDE CONTROL Sport Suspension and AMG® Performance 4MATIC® all-wheel drive, keep you in complete control at all times. At the core of the 2017 AMG® C 63 Cabriolet is an AMG® 4.0L biturbo V8 engine that’s capable of 469 hp and 479 lb-ft of torque, as well as a 17 mpg city/22 mpg highway rating. Noteworthy features include AMG® RIDE CONTROL® Sport Suspension with 3-stage damping, AMG® illuminated door sills, and 18-inch AMG® twin 5-spoke wheels. Under the hood of the 2017 AMG® C 63 S Cabriolet, you’ll find a stronger biturbo V8 engine that outputs 503 hp and 516 lb-ft of torque. From a standstill, the AMG® C 63 S Cabriolet whisks to 60 mph in 4.0 seconds, and uses plenty of AMG® exclusives, such as an AMG® High-Performance Compound Braking System, to augment your driving experience. Your Premier Luxury Dealer in the Johns Creek Area! The 2018 Mercedes-Benz C-Class promises time-honored luxury with a modern and thrilling twist! 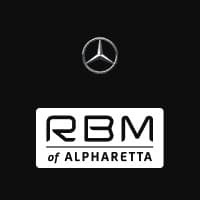 To take the C-Class Sedan, Coupe, or Cabriolet for a test drive, contact the staff at RBM of Alpharetta at . Our dealership I located near John’s Creek at 345 McFarland Parkway in Alpharetta, GA, and our knowledgeable sales department is standing by to assist you from 9:00 a.m. to 7:00 p.m. Monday through Friday, and from 9:00 a.m. to 6:00 p.m. on Saturday!